Note: Over 30 species of aphids can be found in potato fields; many are considered non-colonizing. Pest description and crop damage Aphids are soft-bodied insects with a pair of abdominal cornicles that exude droplets of a defensive fluid. Green peach aphid and potato aphids are the two most common aphid species in potato. Potato aphid is more common in the spring and fall, while green peach aphid peaks during July and early August. Large populations of aphids can cause yield reductions through direct feeding, but their principal economic impact is due to their ability to transmit plant viruses such as potato leaf roll virus (PLRV) and potato virus Y (PVY). PLRV (Polerovirus: Luteoviridae) causes tuber symptoms in some varieties called tuber net necrosis. This internal tuber discoloration is not acceptable in the marketplace. Foliar symptoms occur in younger leaves where leaf margins become necrotic, turning brown and purplish, and curl inwards. PLRV is transmitted in a persistent manner: an aphid that has acquired the virus can transmit it to uninfected plants for the rest of its life. Persistent viruses require a latent period within the aphid before they can be transmitted. The low tolerance in the marketplace for net necrosis, and the high vectoring capacity of green peach aphid, means there is a very low treatment threshold for this pest in most potato crops destined for storage and processing. Potato virus Y (PVY) (Potyvirudae) is a serious disease in potato production in the PNW. New strains of PVY that cause transient foliar symptoms with internal brown lesions in tubers are becoming common. This damage is unacceptable in the marketplace. PVY is transmitted by many different aphid species in a non-persistent manner, which means that aphids probing an infected potato plant acquire the virus, then when moving to a non-infected plant, inoculate it mechanically with the virus. There is no latent period. PVY is transmitted very quickly-in a far shorter time than most insecticides can act to prevent aphid feeding. This, and the fact that most PVY transmission is by non-colonizing aphids (those that do not live in the potato field), means that PVY control with insecticides is poor at best. Biology and life history Green peach aphids arrive on potato in the spring from weeds and various crops where they have overwintered as nymphs and adults, or from peaches and related trees where they overwinter as eggs. 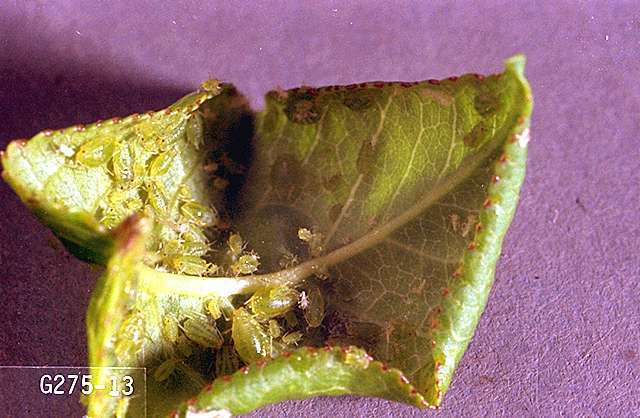 Potato aphids also overwinter as either active nymphs and adults or as eggs, but eggs are laid on roses and sometimes other plants. Both species feed on many crops, weeds, and native plants. 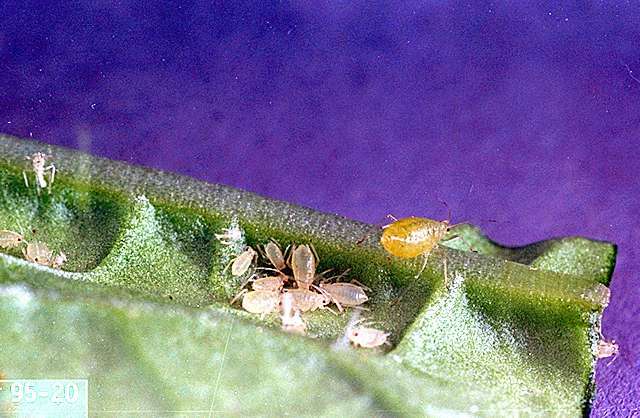 Throughout the growing season aphids produce live young, all of which are female and can be either winged or wingless. In the fall, winged males are produced which fly to overwintering hosts and mate with egg-laying females produced on that host. Both species of aphids found on PNW potatoes undergo multiple overlapping generations per year. Scouting and thresholds Fields should be checked for aphids at least weekly starting shortly after emergence. When plants are upright, the most effective scouting method is beating sheets or beating trays. Field scouts also use half gallon ice cream buckets placed 5 feet from the field. In some varieties, the vines become very long, lie down on the soil and become intertwined, making beating sheets or buckets difficult to use. In this case, a leaf sampling scheme might be useful. 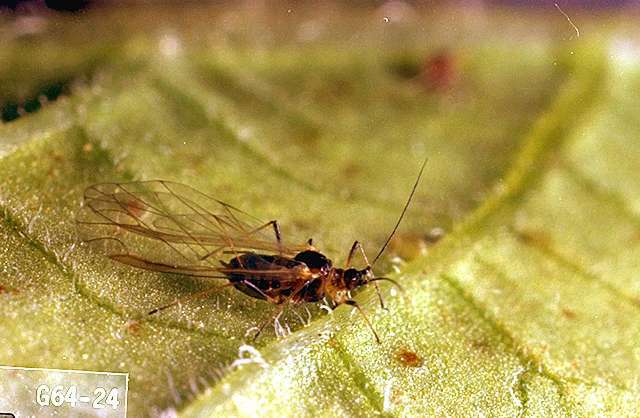 While there are no well-established treatment thresholds for aphids on potato in the PNW, one action threshold that can be used as reference to m­anage PLRV in potatoes in south central Idaho calls for treatment at 10 wingless green peach aphids per 50 leaves for two consecutive weeks, and, in southwestern Idaho, 40 wingless green peach aphids per 50 leaves. Varieties that are susceptible to net necrosis when infected by PLRV require a low treatment threshold, while other varieties can tolerate much higher numbers before treatment is warranted. Seed potato fields require a low treatment threshold. 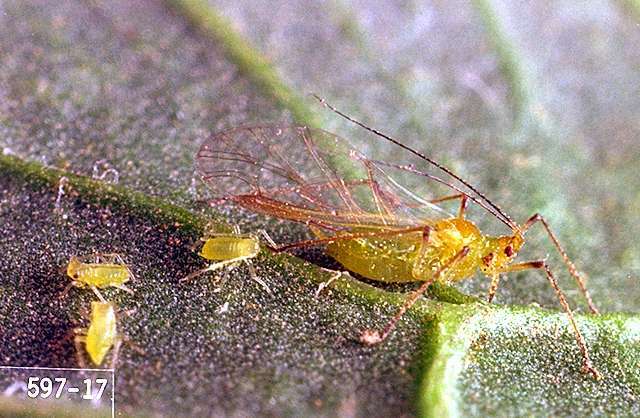 Potatoes can harbor large numbers of generalist predators that feed on aphids. These include the Hemipteran bugs: Orius pirate bug, Geocoris big-eyed bug, and Nabis damsel bug. Other common aphid predators include lady beetles and their larvae, lacewings, and flower fly larvae. Aphid-specific parasitoid wasps can also be common in potato fields that are not heavily treated with insecticides. The most important source of virus in a potato field is infected potato plants. Therefore, purchasing certified seed with low or no virus infection is the best first step in controlling aphid-related damage to potatoes. Controlling other sources of virus inoculum such as cull piles and volunteer potatoes is also important. kaolin-As a spray to foliage and stems it acts as a repellent to some insect pests. Some formulations are OMRI-listed for organic use. plant essential oils (clove, garlic, rosemary etc. )-Some formulations are OMRI-listed for organic use. When used to control other pests, pyrethroid (Group 3 in Tables 1-2) applications make aphid management more difficult. Pyrethroids eliminate aphid predators and parasitoids which naturally control pests in the field. Data show that early applications of pyrethroids cause flare-ups of not only aphids, but other pests such as mites and thrips. When possible, it is best to use aphid insecticides with narrow spectra of control. Avoiding package mixes (Table 2) and other products that kill beneficials.